Bird eggs are full of potential. In the most elegant and simple form, they remind us of new beginnings, of possibilities. Surrounding them, of course, is the tangled mess. Sometimes, great things hatch, sometimes not. In this case, the adult robins disappeared, leaving these three eggs behind. In discovering them, I suppose, the untapped potential passed to me. 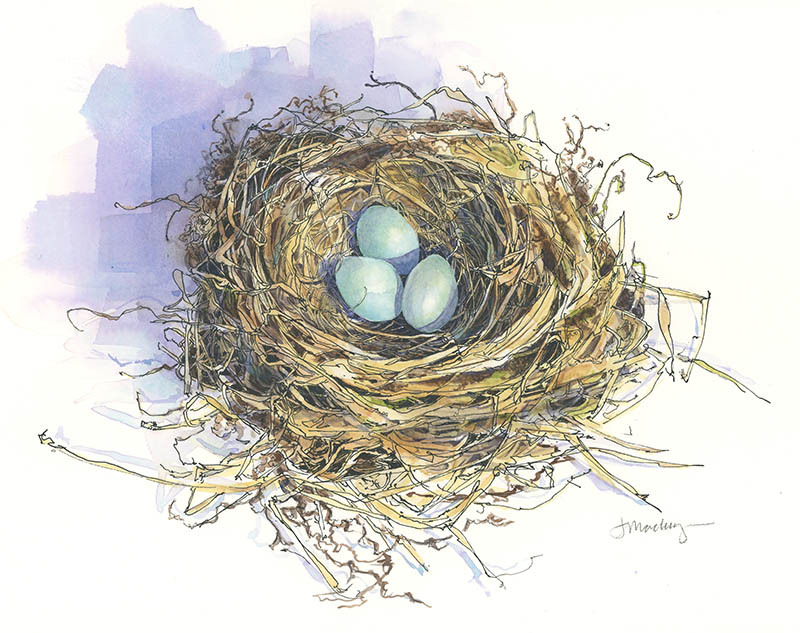 If not in life, then in art, the birds’ legacy lives on. It’s hard to exaggerate the extravagance of ripe peaches. Soft, striking, sweet, juicy…what fruits can rival them? Tomatoes, apples, eggplant, peppers? No match. Pears and cherries? Closer, but still second. Painting them is a pleasure, too. As is eating them, when the painting is done. 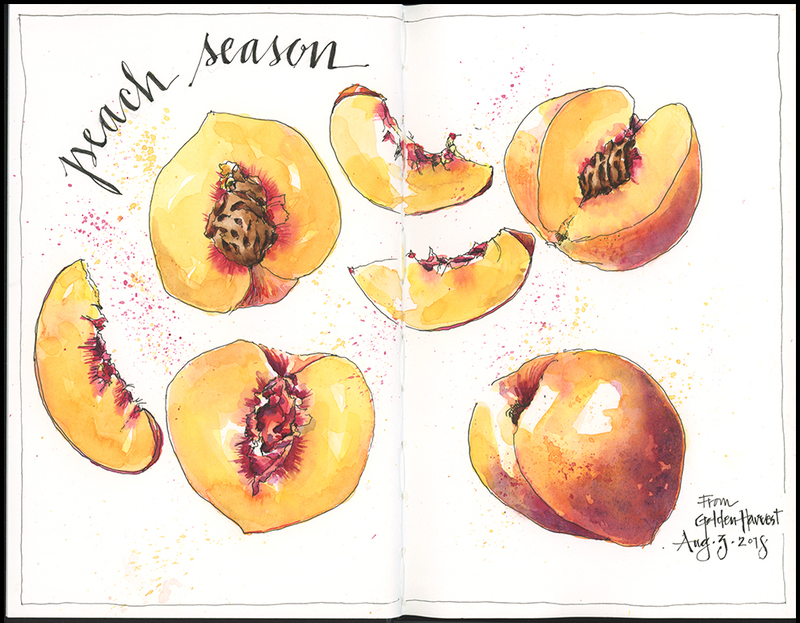 Tips and Techniques: First, I made it clear to my family, “Don’t eat the peaches until I paint them.” The previous three farmstand purchases disappeared before I had a chance at them. I started this as a simple ink sketch, and then painted multiple layers of Hansa yellow medium with quin rose, mixed with ultramarine blue for the darker skin. It’s important to let each layer dry thoroughly before adding the next. Building up layers allows the lighter tones to shine through, creating a more luminous effect than if you tried to get the color “right” in one go. I finished the page with a few details, spatter, and text (click the image to view larger). It was like a crime scene: the beauty lay on the floor, mangled and broken; a mess of soil and tangle of roots lay about her. Alas, it was the amaryllis’s own radiance that did her in. Her blossoms grown so heavy atop the three-foot stalk that she tumbled off the table to the floor just two days after opening. Stricken in her prime— and while having her portrait painted!— I salvaged what I could, dissected one flower for study, and finished these pages. 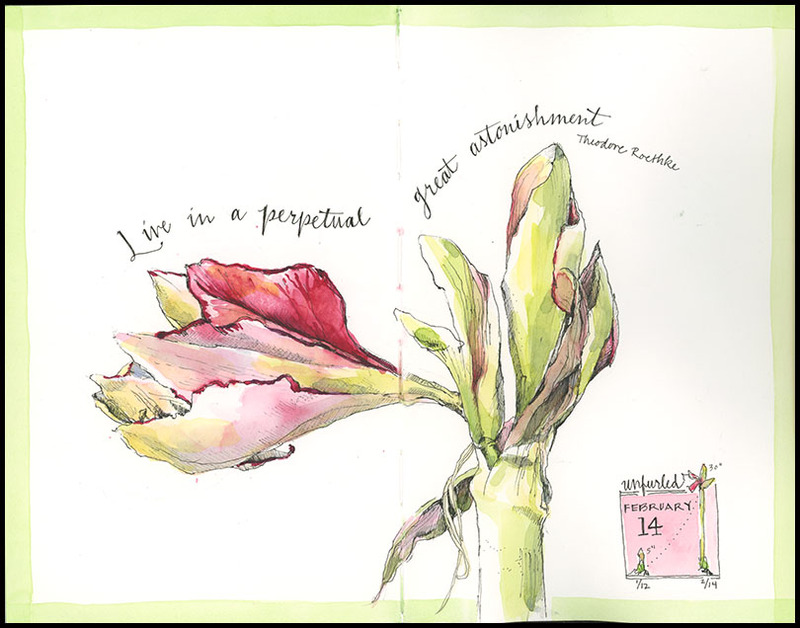 I have spent the last month astonished by this plant, and now, am so grateful that I made time for these journal paintings before the fall (see the first painting here). 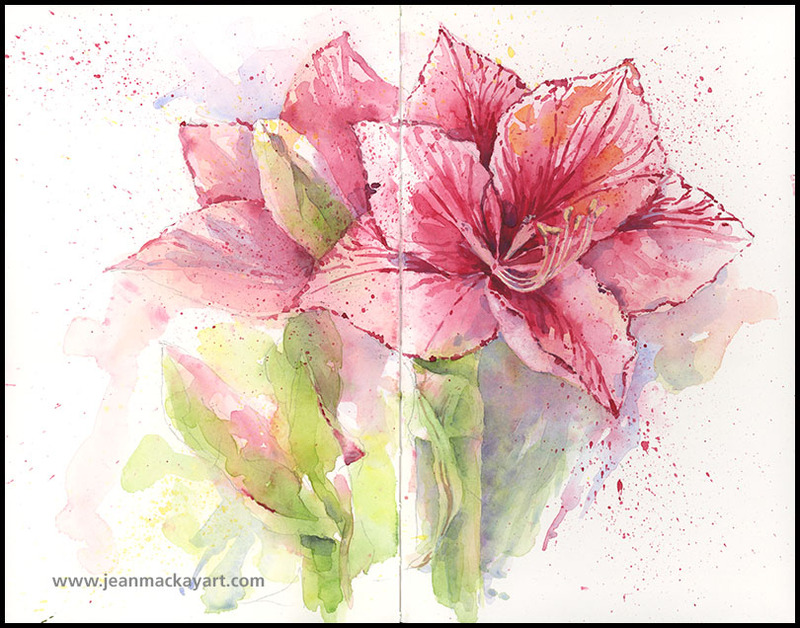 Tips and Techniques– Here are two very different approaches to painting flowers. In the first carefully-rendered ink drawing, I used a Micron pen (size 02), and then added a few layers of watercolor. I love the pen drawing for capturing the unfurling blossoms and twisted sepals. Once the flowers opened, I wanted a more exuberant approach, so I used layers of very loose washes, combining negative and positive painting techniques to bring out the flowers. I wish I had left more white or masked some white areas at the start, particularly for the stamens…notice how much more light-filled the tight drawing is, simply because I left more white. It’s good reminder for next time: let the paper play its part in the piece.